Foreign policy is too important to leave to the 'professionals.' Through art and culture, we can all work to make the world a better place. The position of the body is the same. The figure is prone on the beach, near the water's edge. The head is face down in the sand, and the face is just visible. One arm is close to the body, palm upward. The knees are bent, the feet together. Teeman has reduced art, at least in this case, to little more than ego plus aestheticism. 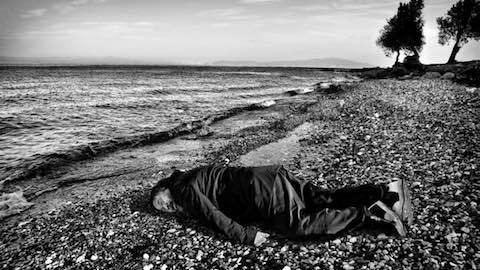 Ai Weiwei, he is arguing, is fundamentally irresponsible -- for not thinking more and inserting himself less. It's a strange criticism coming from Teeman. As a journalist who doesn't generally cover politics -- he writes mostly about popular culture -- he is doing precisely what he faults Ai Weiwei for doing: foregrounding his own opinion (as opposed to sticking to the facts like a journalist) and wading into “big political issues” without thinking very deeply about them. Moreover, just like the Chinese artist, Teeman is aiming to provoke. Well, we often criticize that which we fear, deep down, applies to ourselves as well. Still, Teeman inadvertently raises some important questions. What role can artists play in not only addressing political issues, but also helping to resolve political problems? As provocateurs, can artists do more harm than good? Is all art inherently political -- or are politics and art antithetical? I'll explore these questions not only in this column but also in a new initiative at the Institute for Policy Studies that we're calling Epicenter. Our new effort explores the intersection of politics and culture, precisely the territory that Ai Weiwei inhabits. Though it draws some musical and visual motifs from House of Cards, this production by Search for Common Ground and a Jordanian multimedia company relies more heavily on Tia Leoni's Madam Secretary for inspiration: similar rise to power, nearly identical family make-up, and comparable conspiratorial backstory. Search for Common Ground has pursued this popular culture strategy in several parts of the world -- a children's TV show in Macedonia promoting intercultural understanding, a soap opera about social issues in Guinea, and a multi-nation TV show about footballers called The Team. Here the artists are not simply raising provocative issues. They're modeling the solutions: compassionate leaders committed to non-violence, football players from different socio-cultural backgrounds working together, soap opera characters providing information about public health issues. If Ai Weiwei is the provocateur activist, Search for Common Ground offers public service announcements wrapped up in the garb of popular entertainment. While the activist artist deploys the astringency of vinegar, the public service artist offers the honey of homey narrative. Our new program at IPS, Epicenter, is devoted to lifting up the work of artists as both dissidents and as diplomats -- those who help to provoke conflict where the status quo is unjust and those who hope to resolve conflict where the status quo is violent. We'll be focusing on the Middle East for the next year, with a particular emphasis on Iran. The nuclear deal -- signed in July and implemented in January -- offers a tremendous opportunity to improve U.S.-Iranian relations and pave the way for the resolution of key conflicts in the region: in Syria, Iraq, and even Israel-Palestine. Since the United States and Iran don’t have formal diplomatic relations, much of the work of reconciliation must take place indirectly -- through third parties, in second-track diplomacy, and by people-to-people contacts. One of the more successful examples of this kind of public diplomacy has been in sports. Like soap operas, athletic contests can often reach more people than exchanges in the fine arts. This week, for instance, I write about the extraordinary case of “wrestling diplomacy” between Iran and the United States. Iranian wrestlers participated in the “Rumble on the Rails” in Grand Central Station in 2013. The next year, a U.S. team participated in the World Cup of Greco-Roman wrestling in 2014. What makes these exchanges so important is that, first of all, Iranian wrestlers are so much better than their U.S. counterparts -- so a certain respect for Iranian culture and traditions is implicit in the exchange. World News: "The Art of Dissidence and Diplomacy"